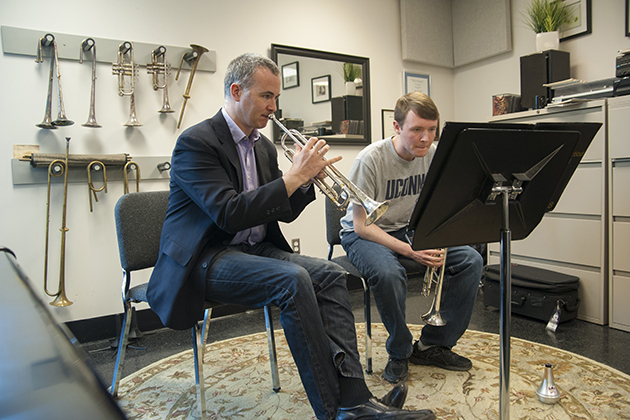 When trumpeter Louis Hanzlik was invited to join the American Brass Quintet (ABQ) earlier this year, it was both a personal and a professional milestone for the associate professor of trumpet and coordinator of applied instrumental studies in the School of Fine Arts. 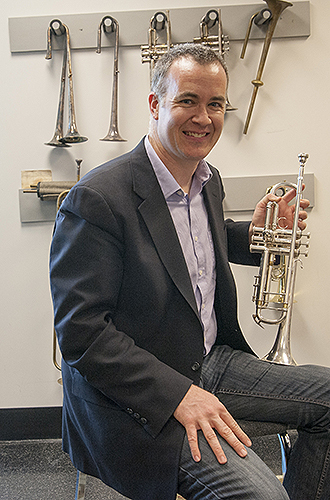 ABQ helped to pioneer the modern brass quintet form in 1960, commissioning original compositions for its performances and serving as the ensemble in residence both at The Juilliard School in New York City, whose president is Joseph W. Polisi ’69 (CLAS), and the Aspen Music Festival in Colorado. Hanzlik has performed at Carnegie Hall as a soloist and ensemble musician many times during his career as a member of the Grammy Award-winning Orpheus Chamber Orchestra. 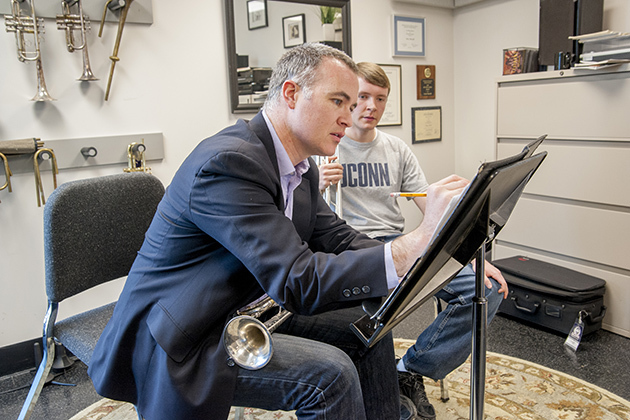 He recently completed his tenure with the Atlantic Brass Quintet during its performance in February, as part of the annual Raymond and Beverly Sackler Composition Prize event in Storrs. Joining a group considered the most distinguished ensemble of its kind is not only a high professional achievement for Hanzlik, it is also very personal – he replaces trumpeter Raymond Mase, one of his musical instructors and mentors. Growing up in Iowa as the son of two school band directors, Hanzlik was surrounded by music. When he was 9 years old, his parents asked him which instrument he would like to learn to play. His interest in the trumpet intensified after he received a copy of a 1987 Wynton Marsalis recording with the Eastman Wind Ensemble, “Carnaval,” which included “The Flight of the Bumblebee from Tsar Saltan,” a rapid melody that Marsalis played on a cornet. The recording included sheet music, and the young Hanzlik practiced on his trumpet between four and five hours a day to learn every piece. A few years later Hanzlik took his copy of the much-used recording – a dubbed cassette with his hand-written track list – to Des Moines when Marsalis was performing there. During a post-concert autograph session, he handed the musician the cassette for a signature. Years later, when Marsalis provided Hanzlik a scholarship to attend the Eastern Music Festival after his freshman year at the University of Iowa, Hanzlik wrote to Marsalis and reminded him of the autograph session and summer practices. Today the trumpeter says he tries to work in two hours of practice each day working on technique and exercises, as he would ask his students to do, and also rehearsing whatever current work he must have ready for an upcoming performance. Since joining ABQ, Hanzlik has traveled to Georgia, Tennessee, and Wisconsin to perform, and he will spend most of May with the group playing concerts in Australia, before going to Aspen for a summer of teaching and performing. Commuting by car to New York City for his ABQ rehearsals and Juilliard responsibilities, Hanzlik says he mostly listens to something different than what is on his performance music stand. Most often he prefers public radio, but when he does listen to music, it is an eclectic mix. Hanzlik says performing and touring with his ensembles is something he hopes will inspire his students, as his teachers once inspired him. “I was always enamored when I was studying with teachers in the field doing it, making contributions and performing at Carnegie Hall. I was looking for that information,” he says. “You can serve as a model for how to get involved in the business of music, because if the teacher is doing it they have that insight in terms of establishing a press kit, working with a manger or agent, making a recording or learning how to take an audition with a group. My teachers were my role models and I would always copy them. In my lessons, in recordings, or in the way they sounded on the Carnegie Hall stage.